At some point in this process, you may decide not to engage with a group, that the engagement is not productive or the group may go public with criticism or a campaign despite ongoing discussion. In today’s social media-driven, 24-hour news cycle, the window of opportunity to tell your story is very small. Having a response plan ready that positively communicates your position and anticipates their likely actions is essential and will allow you to quickly execute should it be necessary. While speed is of the essence, you need to calibrate your response so you don’t escalate the issue by overreacting. Likewise, waiting to see how it plays out risks losing the opportunity to shape the initial narrative, or be included in news stories or online discussions, and a second chance to comment rarely occurs. Weigh the risk of providing legitimacy and amplifying the campaign by responding against the potential for reputational harm from remaining quiet. Determining appropriate engagement varies with each situation, and is as much art as science. Utilizing internal and external public affairs or public relations experts can assist in analyzing the situation and determining the appropriate response. It’s impractical to develop a response plan for every potential issue, but preparing some core materials in key areas will provide framework for a rapid and strategic response, should it be needed. You are likely already monitoring news and social media coverage of your company or brand. If the issue isn’t currently on the monitoring radar, add it. If you are subject to a campaign or attack, you may need to increase the frequency of monitoring and modify your criteria for responding or engaging in online conversations. Your strategy for reaching out to or responding to media requests depends on the specific scenario and media outlet. As noted earlier, you rarely have a second chance to help shape the initial narrative, so at a minimum making sure media has access to your sustainability messaging, and if appropriate, background on your interactions with the group can provide balance to their reporting. If a reporter learns you have been actively engaging with the group and are looking at the issue, it may positively impact their coverage. 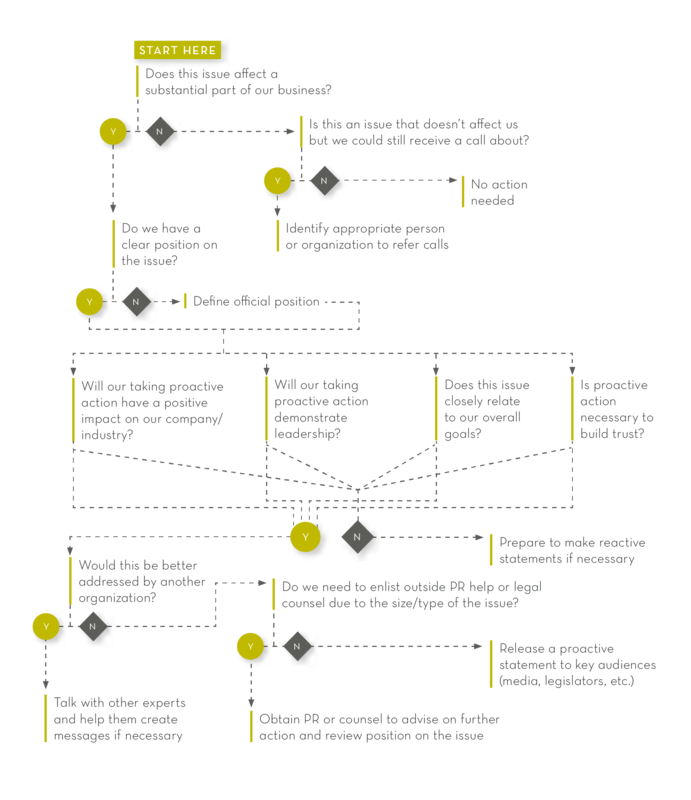 See the Traditional Media Engagement Response Decision Tree below for more information. Your proactive sustainability communications plan likely includes positive posts for your various social media properties and should be activated in case of an attack. Criteria and process for responding to social media conversations, as well as traditional media, should be in place in advance of an attack to allow quick decision-making to appropriately manage the conversation (see Online Engagement Response Decision Tree below). Also, consider what resources may be needed if the conversation is brought directly to your Facebook page or Twitter feed. If you choose to respond to posts, do you have enough people and internal resources to do it in a timely way? What are your options depending on volume and tenor of the conversations? Social media conversations don’t stop at the end of the business day or week so weekend and evening monitoring and responses may be needed. 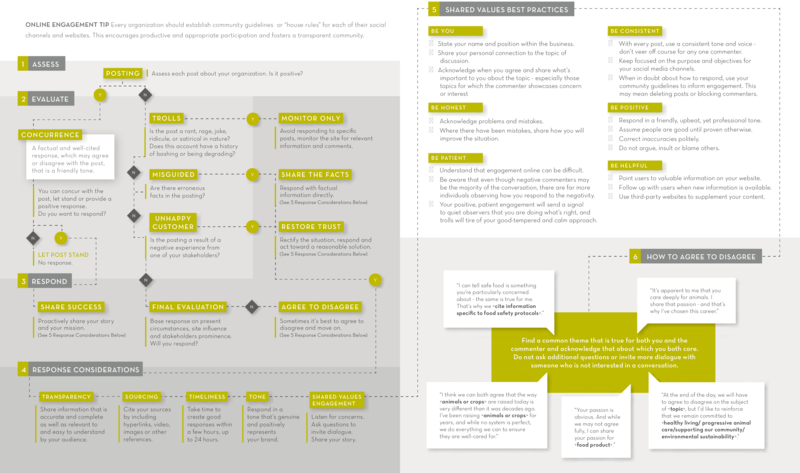 See the Online Engagement Response Decision Tree below to assist in managing online interactions. A dedicated sustainability area on your website provides “always on” access for reporters and other stakeholders. Be sure the information is current and plan how the content can be highlighted on the homepage in the event of an attack or campaign. Consider developing “dark” pages or sites where you can stage information specific to an issue but not make it public until it is needed. The Center for Food Integrity is a not-for-profit organization. Our members and project partners, who represent the diversity of the food system, are committed to providing accurate information and working together to address important issues in food and agriculture. The Center does not lobby or advocate for individual companies or brands.